Abi O and Karen Betts at Professional Beauty 2018! Wow! What a few weeks it’s been for us at BeauBronz and BeauBeauty! After the launch of the BeauBeauty site and the 2018 training sessions with BeauBronz Academy, the BeauBronz army is growing – and positively glowing! Somewhere in between expanding the BeauBeauty arm of her business, training new BeauBronz students, tan-touring celebrity clients and attending awards shows, managing director Abi O has somehow found the time to get back in the saddle and do what she does best – presenting! 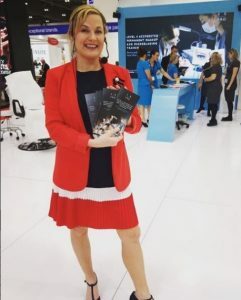 Recently, Abi O took to the stage at Professional Beauty at the Excel Centre, London to promote the work of Karen Betts, the UK’s no.1 expert in permanent makeup. Abi O and Karen Betts’ are two ladies cut from the same cloth: They both share an unrivalled passion for beauty and for improving the lives of others, and they also relish the opportunity to collaborate – which is why Karen invited Abi to compere at the renowned beauty exhibition. Abi O is no stranger to presenting, having worked in the beauty and entertainment industry for over twenty years. After graduating in Drama from Chelsea and Kensington College, She appeared in numerous music videos and TV adverts. After featuring in multiple commercial campaigns, she turned her attention towards TV presenting. It was here where she discovered her talent for live improvisation, subsequently guest presenting on QVC and Ideal World. She was even invited on to ITV’s This Morning for a guest segment piece where she taught Phil Scofield and Ho lly Willoughby how to spray tan using the Beau Bronz professional tanning products! The Professional Beauty show, which is held every year at the end of February, attracts thousands of industry professionals from beauty students to salon, spa and clinic owners. Hundreds of worldwide leading beauty brands including Dermalogica and Guinot turn out to showcase their latest products and launches – and this year was no exception, with retail sales reaching fever pitch. It can be difficult to attract attention when you’re competing for crowd attention, but industry legend Karen Betts is out there leading from the front. 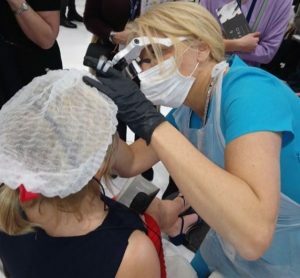 With Abi O on the microphone, the crowd flocked and grew, all eager to see Karen demonstrate her infamous microblading technique on Abi, who spoke on the mic throughout the procedure – talk about multitasking! But this wasn’t the first time Abi O has had her brows tended to by Karen. As somebody who takes pride in her appearance and who loves a full brow, Abi has visited Karen on numerous occasions over the years for micoblading top-ups. The microblading treatment is a type of permanent cosmetic treatment usually performed in two stages – the first stage typically including a consultation. Karen works with a manual hand-held tool which she uses to create small hair strokes, in the dermal layer of the skin. The channels mimic the direction of the natural direction of brow hair. Pigment is then implanted into the channels leaving the effect of ultra-realistic looking brows. The procedure is popular among those who have over-plucked their brows, sustained an injury which has lead to hair loss, or for patients who have been ill and who may have lost brow hair. It is also highly sought after by those who want to change the shape of their brows to create a fuller-looking and more intense brow profile. And, despite the precision of the tool, the procedure causes minimal discomfort. Ask Abi O, who smiled her way through the procedure while talking to hundreds of fascinated on-lookers! The result? A more confident, assured looking Abi, with brows to boot! Karen Betts is one of the most established permanent makeup artists in the UK, offering a range of treatments for brows, eyes, lips and breasts. In addition to her London Harley Street clinic, she also runs practices in Cheshire and Yorkshire. For more information about the infamous Karen Betts, visit her website at www.karenbetts.co.uk or call 0844 801 6838.